Detailed Laying Method for Bonded Mulch ! Rubber mulch and resin are delivered to site in 10kg bags mulch and 25kg kegs resin. To mix, you can use paddle mixer and tub, a clean concrete mixer or ideally a forced action mixer. It can even mix by hand avoiding contact with your skin. You will also need gloves, trowel, depth block, cloth, funnel, measuring jug, bucket and a porous membrane. Prepare the ground, flatten the soil as best you can. Lay the membrane over the soil area. Edging can be used otherwise the sides can just sink into a “V” trench at 45 degrees. Prepare the bonded rubber mulch mix, place 1 x 10kg bag or 2 bags if you are blending colours in the mixer and start turning. Ensure a full measure of binder from the keg goes in a measuring jug. The ratio is 5:1 by weight or 5:1 by volume (1kg = 1.1liters). 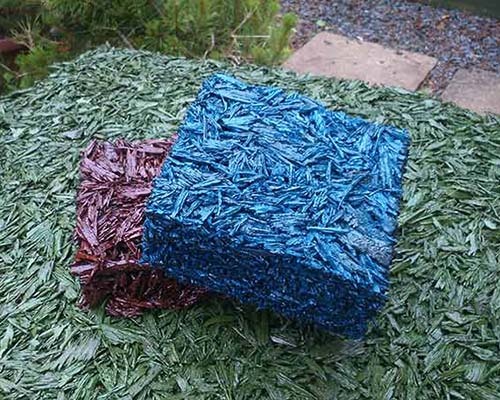 Add 2kgs of resin to each 10kgs of mulch. Let the rubber and resin mix for 3-5 minutes or until an even consistency is achieved. Pour straight from the tub or via a bucket to the area being worked on. Use a block of wood to gauge a consistent depth. It can be tampered to the ground usually to 50mm. Do not compact/squash it. A two man experienced team could install in the region of 100sq metres per day. Caution: ensure that the mulch is dry and stays dry during curing. If you are leaving an edge to join to the next day, keep it jaggered so that lines are not obvious to the eye. Call MonsterMulch on 0191 645 1685 if you have any further questions. Disclaimer: This system is designed to be installed for a wide variety of applications, subject to the performance requirements for your particular application and your existing site conditions, the degrees of preparation may vary. Coastal areas can be problematic with the salty air reacting with the coloured coatings. Also busy airport flightpaths can have atmospheric fuel solvents accelerating the breakdown of the environmentaly friendly colour mulch coatings. The result can be that after just a few years heavy use, black from the rubber can start rubbing off (This does not happen with wetpour). This can be treated through either applying the sealer Q-pol or we can spray it with a coloured alipathic primer. This is a new system being tested and so far shows the same performance as Bonded Mulch whilst saving over 20% in costs. However this only becomes coste effective above about [email protected] depth. For example our tests show a that a 40mm bonded mulch system can perform exactly the same as a hybrid of 20mm top layer bonded mulch (with 20% resin) and 20mm base layer 2-6mm rubber crumb (10% resin). 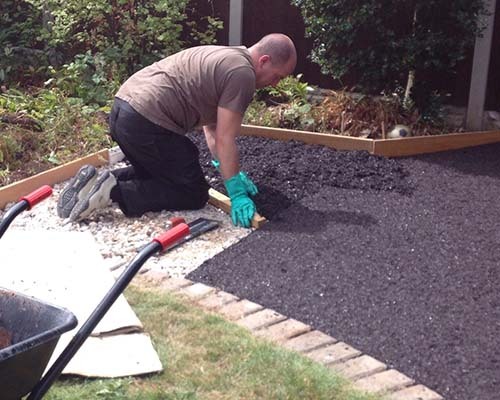 After all, the more expensive coloured bonded mulch can not be seen 20mm down and the resin to hold the rubber together is not as critcal in the base layer as the top layer. The only downside may that laying may takes 2 days instead of one because the base needs curing firstly. Also if the same mixer is being used it will need cleaning out after the laying the 2-6mm crumb SBR base layer. Please enquire for more information. We strongly recommend that it is our resin to be mixed with the rubber we supply. The resin can loose its binding strength if it has been kept over 25c or is older then 6 months before it is installed. Ensure no rain or damp on the mulch at the time of mixing and installation. Ensure the temperature at the time of mixing and curing is not below 5c. We recommend using our Polysolv cleaning agent on the trowel as the mulch is being laid.